The Title Page of the 1830 Edition of the Book of Mormon. Image via history.lds.org. Nathaniel Hinckley Wadsworth, “Copyright Laws and the 1830 Book of Mormon,” BYU Studies 45, no. 3 (2006): 77–96. 1. See as recently as Russell M. Nelson, “The Correct Name of the Church,” Ensign, November 2018, 90n9. 3. See for instance Daniel P. Kidder, Mormonism and the Mormons: A Historical View of the Rise and Progress of the Sect Self-Styled Latter-day Saints (New York, NY: Carlton & Lanahan, 1842), 256; John H. Kelson, “The First Edition of the Book of Mormon,” The Latter-day Saints’ Millennial Star 39, no. 48 (September 27, 1886): 613; D. J. McMillan, “Conversion of a Mormon Priest,” The Assembly Herald, October 1902, 403. 4. Kelson, “The First Edition of the Book of Mormon,” 614; B. H. Roberts, ed., History of the Church of Jesus Christ of Latter-day Saints, 7 vols. (Salt Lake City, UT: Deseret Book, 1980), 1:58–59; Kenneth H. Godfrey, “Not Enough Trouble, review of Trouble Enough: Joseph Smith and the Book of Mormon by Ernest H. Taves and Joseph Smith and the Origins of the Book of Mormon by David Persuitte,” Dialogue: A Journal of Mormon Thought 19, no. 3 (Fall 1986): 143; Miriam A. Smith and John W. Welch, “Joseph Smith: ‘Author and Proprietor’,” in Reexploring the Book of Mormon: A Decade of New Research, ed. John W. Welch (Provo, UT: FARMS, 1992), 154–157; Grant Hardy, “Textual Criticism and the Book of Mormon” in Foundational Texts of Mormonism: Examining Major Early Sources, ed. Mark Ashurst-McGee, Robin Scott Jensen, and Sharalyn D. Howcroft (New York, NY: Oxford University Press, 2018), 40n9. 5. The Book of Mormon: An Account Written by the Hand of Mormon, upon Plates Taken from the Plates of Nephi (Palmyra, NY: E. B. Grandin, 1830), copyright page, emphasis added, online at www.josephsmithpapers.org. 6. Smith and Welch, “Joseph Smith,” 156. One example of a “translator” claiming the title “author and proprietor” can be seen in Thomas S. Brady, A New Guide to Conversation, in Spanish and English (New York, NY: James Cunningham, 1824). The title page of this dual-language (Spanish-English) volume identifies Brady, the translator, as “teacher and translator of ancient and modern languages,” whereas the copyright page immediately after names him the “author and proprietor” in the exact same legal language as used in the 1830 Book of Mormon copyright. 7. “We also know that they [the plates] have been translated by the gift and power of God, for his voice hath declared it unto us.” The Testimony of Three Witnesses, online at www.josephsmithpapers.org; “And as many of the leaves as the said Smith has translated, we did handle with our hands.” The Testimony of Eight Witnesses, online at www.josephsmithpapers.org. 9. The manuscript copies of these revelations can be accessed online at “Correlation of Current Doctrine and Covenants with Earliest Sources on the Joseph Smith Papers Website,” online at www.josephsmithpapers.org. See also the printed versions of a few of these revelations in the 1833 Book of Commandments II:5; IV:2, 10; V:11. 10. The Book of Mormon, preface, iii–iv, online at www.josephsmithpapers.org. 12. Smith and Welch, “Joseph Smith,” 156. 13. David J. Shepherd, “Rendering Fiction: Translation, Pseudotranslation, and the Book of Mormon,” in The New Mormon Challenge: Responding to the Latest Defenses of a Fast-Growing Movement, ed. Francis J. Beckwith, Carl Mosser, and Paul Owen (Grand Rapids, MI: Zondervan, 2002), 368. For just one contemporary example, see the interview with John H. Gilbert, the typesetter for the 1830 Book of Mormon, in William H. Kelley, “The Hill Cumorah, and the Book of Mormon,” Saints' Herald 28, no. 11 (June 1, 1881): 164. 14. See for instance, Alexander Campbell, “Delusions,” Millennial Harbinger 2, no. 2 (February 7, 1831): 93; Jonathan Baldwin Turner, Mormonism in All Ages: Or, the Rise, Progress, and Causes of Mormonism (New York, NY: Platt and Peters, 1842), 202; James H. Hunt, Mormonism: Embracing the Origin, Rise and Progress of the Sect (St. Louis, MO: Ustick and Davies, 1844), 61; Pomeroy Tucker, Origin, Rise, and Progress of Mormonism (New York, NY: D. Appleton and Company, 1867), 65. 15. Copyright for Book of Mormon, 11 June 1829, online at www.josephsmithpapers.org. See the discussion in Nathaniel Hinckley Wadsworth, “Copyright Laws and the 1830 Book of Mormon,” BYU Studies 45, no. 3 (2006): 77–96. 16. Title Page of Book of Mormon, circa Early June 1829, online at www.josephsmithpapers.org. 17. Gerrit J. Dirkmaat and Michael Hubbard MacKay, “Joseph Smith’s Negotiations to Publish the Book of Mormon,” in The Coming Forth of the Book of Mormon: A Marvelous Work and a Wonder, ed. Dennis L. Largey, Andrew H. Hedges, John Hilton III, and Kerry Hull (Provo, UT: Religious Studies Center; Salt Lake City, UT: Deseret Book, 2015), 157. 18. 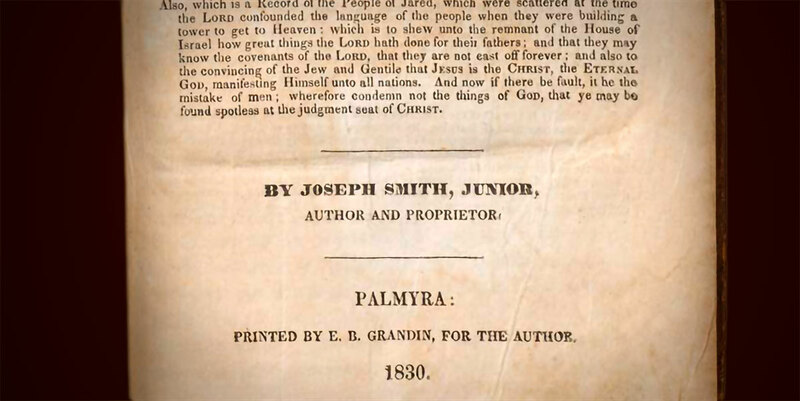 See “Historical Introduction,” on Title Page of Book of Mormon, circa Early June 1829, citing News item, Wayne Sentinel (Palmyra, NY), 26 June 1829, ; “Golden Bible,” Palmyra (NY) Freeman, 11 Aug. 1829, online at www.josephsmithpapers.org. 19. Oliver H. P. Cowdery to Cornelius C. Blatchly, November 9, 1829, in Larry E. Morris, ed., A Documentary History of the Book of Mormon (New York, NY: Oxford University Press, 2019), 374–375. For an online transcription of this letter, see “1829 Mormon Discovery Brought to you by…Guest Erin Jennings,” The Juvenile Instructor blog, online at www.juvenileinstructor.org. 20. Cowdery to Blatchly, in A Documentary History of the Book of Mormon, 374–375, spelling standardized. 21. Webster's Dictionary 1828 - Online Edition, s.v. “author,” online at http://webstersdictionary1828.com, emphasis added. 23. Cowdery to Blatchly, in A Documentary History of the Book of Mormon, 375, punctuation standardized. 24. For another example, see the discussion of the historical use and definition of terms such as “ordain” and “keys” in “Joseph Smith’s Teachings about Priesthood, Temple, Women,” Gospel Topics Essays, online at www.lds.org. 25. Jeffrey R. Holland, “‘Lord, I Believe’,” Ensign, May 2013, 93–95; Dieter F. Uchtdorf, “Come, Join with Us,” Ensign, November 2013, 21–24; M. Russell Ballard, “Stay in the Boat and Hold On!” Ensign, November 2014, 89–91. 26. See Michael Hubbard MacKay and Gerrit J. Dirkmaat, From Darkness unto Light: Joseph Smith’s Translation and Publication of the Book of Mormon (Provo, UT, and Salt Lake City: Religious Studies Center, Brigham Young University and Deseret Book, 2015); Neal Rappleye, “‘Idle and Slothful Strange Stories’: Book of Mormon Origins and the Historical Record,” Interpreter: A Journal of Latter-day Saint Faith and Scholarship 20 (2016): 21-37.